Channel 10 News featured Saving Grace when they discovered we had rescued a litter of 6 week old puppies that had been foynd in the middle of the road in Miami in a plastic trash bag. Two of the puppies in the litter were missing one back paw. We provided medical care and foynd them wonderful homes when they were old enough. Saving Grace specializes in rehabilitating puppies and their mother's. Our foster homes are transformed into puppy nurseries! Nino is a little 10 year old Maltese that was rescued from a very neglectful owner who wasn't feeding him and left him outside matted and covered in fleas and ticks. They must have shaved him down and his skin was raw. He had a terrible infection in his body and was on antibiotics for a few months. Now his fur is growing back, he's feeling better, and he knows that he's loved for the first time! Sinatra is an Husky that was found wandering the streets of Miami. A good samaritan offered him a cheeseburger and he jumped into her car! We took him into our rescue for medical care. He had the worst skin infection due to mange. With lots of medical care, TLC in a loving foster home, and some behavioral training Sinatra is now in a loving home where he is adored! I went to the shelter to pick up a dog and I saw a little chihuahua curled up in the back. When I went to see what was wrong she couldn't stand. Come to find out she has two broken front legs that no one was aware of. We rushed her to the vet for x-rays and a cast. After two months her legs were repaired and she was just fine! Now she runs and plays and lives a very happy life! Millie is 1 yr old terrier who was rescued from MDAS on the code red list. 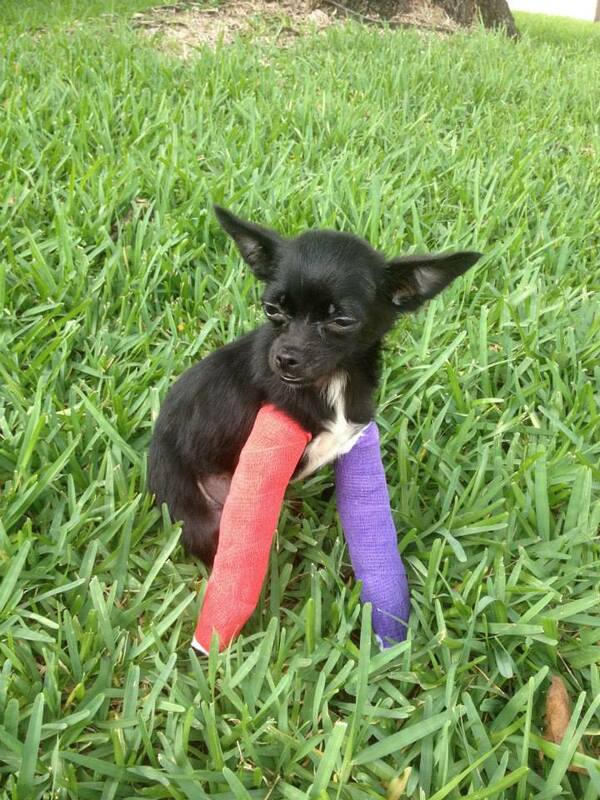 She has a permanent spinal cord injury that has left her paraplegic in her back legs. She uses her front legs to scoot around. She survived on the streets of Miami like this. She is very friendly, affectionate, and loving. SShe has her own doggie wheelchair and as long as you express her a few times a day she is house trained. We can all learn from her strong, loving spirit!! She found a loving home that is able to care for her special needs. Foster homes are where volunteers devote their time and energy to rehabilitate the dogs/cats in their care. They provide medical care and socialization until they are ready to go to a permanent home. All our animals are in foster homes until they are adopted. Donations provide food, bedding and all other needs for our foster network. Most of our rescues are in need of serious medical care. Through donations, we are able to use our wonderful network of veterinarians to save these lives which would otherwise be euthanized at the county shelter. Learn more about Saving Grace and Her Furry Friends, Inc.